The Intro from Classic have been unmatched over the past 17 years in quality and performance. 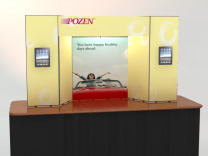 The secret to the success of the Intro line of trade show displays, lies in the patented hinge system which gives the framework of the Intro, unmatched strength, plus it will never wear out or show its' age. Now that's Quality! 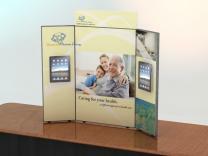 Display Boards, as they have been known, have been popular for many years due to the variety of uses; from trade shows to corporate lobby displays- plus the many uses for non-profit organizations, trade and technical schools, and college job fairs, which are held all over the country each year. 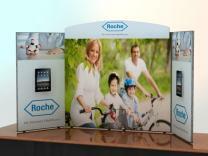 In the early years of the trade show industry, table top displays were simply boards with fabric coverings. These display boards by our current standards were very crude; however with the advent of better fabrics, new construction materials and better hinge mechanisms, the exhibits that are available today are rugged, durable and attractive. 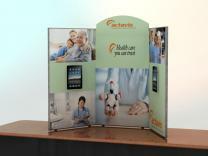 They are stackable and all come with Velcro compatible fabrics in over 50 different colors. 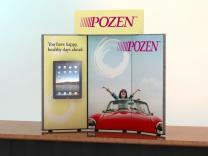 Take a look at the outstanding lineup of trade show display accessories for your flat panel displays from Classic Exhibits. 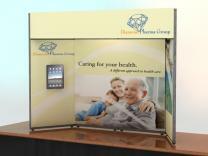 There's a whole world of great trade show exhibits to choose from at great prices and great warranties. Classic Exhibits has created a number of new outstanding products in the past few years that capitalize on lighter weight materials such as extruded aluminum and fabric, to bring new market driven products to the trade show exhibit industry. How did Classic come up with the right formula for success in the wake of a turbulent economy over the past 4 years? By careful observation of their own business over time, they realized that certain aluminum extrusions had much greater value in cost per running foot of metal than other shapes, and concluded that utilizing those particular shapes in future product development could bring great returns in the marketplace. 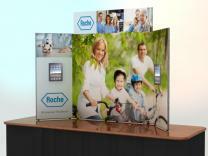 As Classic proceeded ahead based on good gut level instincts and some careful planning, they've been able to introduce a whole series of successful displays that have as a group injected new life into the custom modular hybrid displays market. 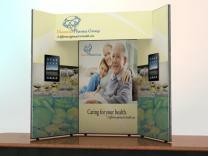 Heading the list of new custom modular hybrid displays is the Perfect 10 followed by the Magellan Miracle and Sacagawea tension fabric displays. For the distribution network for Classic Exhibits products, the future looks bright due to the creativity and ingenuity on Classic’s part, and some great promotion through a program they created called exhibit design search, which is an online search program for trade show booths which we utilize extensively on the ShopForExhibits.com web site. 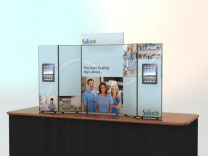 One of the front runners in the online retailers of trade show displays, ShopForExhibits.com, continues to expand what they provide their nationwide clientele, through their display rentals program which was begun only two short years ago, and the new tension fabric products. To keep pace with the business activity they forecast in the future, ShopForExhibits.com has just gone live with an entirely new web site which delivers prospective customers with an elevated level of product support along with product videos and product templates. 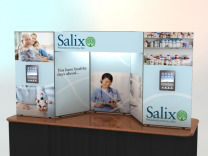 Facing uncertain economic challenges, the online trade show exhibit retailers such as ShopForExhibits, are working diligently to provide not only reasonable price points for their products, but exceptional values in terms of ways of graphically imaging a companies message, to quickly move prospects to buy. Not every business will succeed in successfully bringing new products such as tension fabric displays, to market via the internet, but ShopForExhibits has positioned themselves in a positive way through their industry and product experience, and on line communication skills, to have the best possible opportunity to succeed in this most competitive market.